As with our 2 Minutes on Site with the CIL TriTank, we are now showing you our alluvial and hard rock plant on site with the RG100 Combo for gold recovery, although we do provide similar plants with the option of bulk mineral recovery. This plant is medium sized but was designed to be neat, making the on-site experience more enjoyable as well as simple to operate and high in recovery capability. It is a 'combo' plant because it features a hard rock crushing section as well as the alluvial section, as opposed to our RG100 which is used when hard rock crushing is not required. The video below shows how APT's RG100 combo plant operates and the neat lay-out we have for it. This plant in particular was recently installed and commissioned in Africa and we thoroughly enjoyed the whole process. For more on-site videos, we recommend visiting our mining videos page here. We have included informative videos, site visits showing how the mines operate in reality and how the plants work and more. If we have left anything out that you would like to see, let us know and we will definitely include it. We try to keep our mining equipment videos short and sweet, allowing you to briefly experience a mine site and see it the APT way. 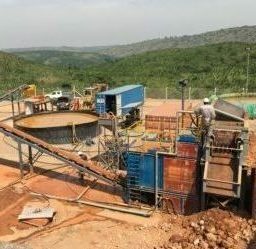 If you would like more information on the APT RG100 Combo plant, please visit similar plants on our website; here you can find gold recovery options, and here bulk mineral recovery options. We welcome you to also email us with any further queries you may have or contact us through our website here. Below are some pictures from the site, which show the whole plant layout. In case you missed it, our phone number has changed to (27) 10 035 1001 and we will be phasing out our old line within the next few weeks. Older PostMining Equipment Out this Week & Phone Number Change!